The Sea Ray 400 Sundancer is known for its luxury and elegance. 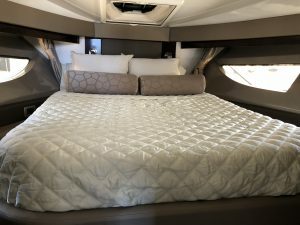 The mid-cabin floor plan of the 400 Sundancer is arranged in the conventional manner with the owner’s stateroom forward, an open galley in the main cabin, and a mid-cabin stateroom with a privacy door. This luxury boat truly calls for the best when it comes to comfort and design and that’s where our design team came into action. We provided our very best 9” pillow top mattress constructed with a super comfy 6” (medium) Latex core. We then add 2” of ultra-soft latex Pillow Top and cover it in the plushest of bamboo quilting. The result is one Plush mattress. It actually makes you feel you are in the bed of a 5-star hotel. Each boat mattress we make is crafted custom in California and built to stand up to rigors of a marine environment. We specialize in Latex. The benefits of a latex mattress include being mold and mildew resistant, extremely comfortable, latex helps regulate body heat, which allows you to sleep cooler, and it will not absorb smells. Our 600 thread count Egyptian Cotton sheets are a must to go with our mattresses. Our sheets are sold as a set including a fitted sheet that is made custom to fit the size and shape of your specific bed, a flat sheet and two pillow cases. Our sheets provide a manicured look to your bed and are super easy to put on. For this Sea Ray, we did our silken quilted coverlet that is both decorative and practical. Made of tencel, it is really soft and machine washable. 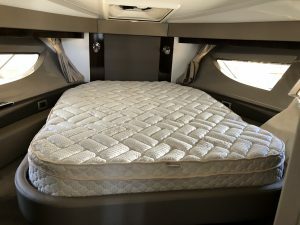 Our coverlets fit the size of your bed, are quilted with a medium weight batting, and a drop to give a beautiful custom look as you can see in the image. The bedding looks very elegant and goes beautifully with the décor of this stateroom. The beauty of our bedding is that it is all custom. Duvets, coverlets, blankets or sheets, no matter what is ordered, each product is made custom for our particular client keeping in view their choice and comfort. Visit our website to view our entire line of products and feel free to contact us and we would love to walk you through the process of making your stateroom, a STATEMENT ROOM.